Some clients may need to show the unit price for each product you are going to sell on the checkout page. If your client asked this, or if you are your own client and want to add this feature, there’s an easy way to do so in WooCommerce. As you probably know, WooCommerce allows to override the core templates with your custom templates. This feature is mostly used by themes developers who heavily customize WooCommerce pages. You will do the same to add the unit price in the Review Order table in the Checkout page. Note: If you are using a custom theme which already overrides the template review-order.php be careful. This may break your theme. Contact the theme author before to override the template. Unzip the file downloaded and put the file in wp-content/themes/your-theme-name/woocommerce/checkout/. If the folder woocommerce/checkout/ does not exist in your theme, create it. P.S. These downloads are powered by Download Monitor, a WordPress plugin which provides an intuitive UI for uploading and managing downloadable files, inserting download links into posts & logging downloads. Do you like it? Download it for free! Hi thanks for this, what I’m trying to do is slightly different and its driving me crazy!! Why does woocommerce not offer the price per unit? I’m doing add to quotes rather than cart. So people only get an email proposal and can view their account. Can you help me? you can do that by turning your store into a catalog (remove cart, checkout, prices) by using Catalog Visibility Options. 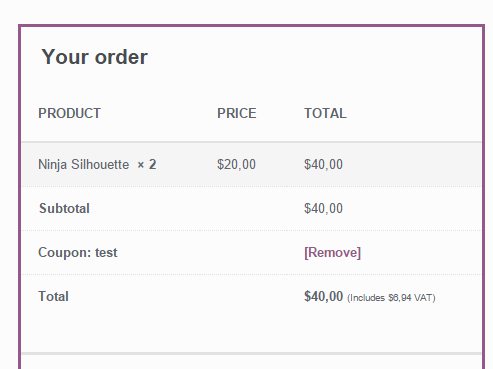 Then use Product Enquiry Form to add a form on the product page. This form will be used by your customers to ask info and quotes. I’m sorry but I don’t know either, I never used that plugin. I’d suggest you to check with the plugin author! Hi ! I have added this file into my child theme/woocommerce/checkout/ directory but it is not working. either when I am editing the template file from plugin it is also does not working. Do you have any tested solution please let me know. I just tested this again and it works fine with Storefront. Please test with a different theme, it could be a conflict with the theme you are using. I just added the file, but it’s not working for me. I don’t see the unit price column neither at checkout nor in the review order page. I works just fine today. Is there a way to add the unit price to the order details in the My Account section? Yeah im searching solution for this please..